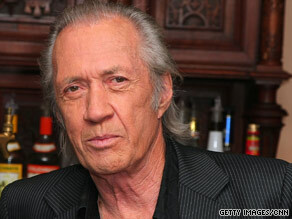 Carradine became famous in the 1970s after starring in the TV series "Kung Fu"
(CNN) -- American actor David Carradine has been found dead, hanging by a nylon rope in a hotel room closet in Bangkok, Thailand, according to a Thai police official. David Carradine became famous in the 1970s after starring in the television series "Kung Fu." Carradine became famous in the 1970s when he starred in the television series "Kung Fu." The rope was believed taken from the hotel room curtains, Bangkok Police Lt. Colonel Pirom Chanpirom said. Investigators found no sign of a forced entry into Carradine's room, Chanpirom said. An autopsy was being conducted at a Bangkok hospital, but no results will be available for another day, he said. A Carradine family spokeswoman issued a short statement saying the family "is devastated by the news of David's passing." "Circumstances surrounding his death are still unknown, and there will be no further comment until more information can be confirmed," the statement said. "The family appreciates the many expressions of condolence, and asks for privacy at this time." Carradine's personal co-manager, Tiffany Smith, said police provided the family with information about their investigation. Carradine's friends and personal managers said they were in "complete shock" and brushed aside suggestions that Carradine might have taken his own life. Actor Michael Madsen told CNN's Larry King that the one thing Carradine's wife, Annie Bierman, wanted everyone to know is "David was not suicidal." Chuck Binder, Carradine's manager for the last six years, said he spoke with a producer in Thailand who thought there was foul play. "I don't know if I'd call it accidental," Binder said, adding that Carradine's career was on a roll and his life was on an upswing. Carradine was in Bangkok for filming of the movie "Stretch," being produced by a United Kingdom-based company, Smith said. "He was the only American cast member," she said. "He was a rock star at the time 'Kung Fu' came out," Tarantino said, holding up a vintage metal lunch box with an image from the popular show. "He was clearly an actor who followed his own path," said Leah Rozen, movie critic for People magazine. "He was never a guy who talked a whole lot. You knew as an actor, the characters he played, you knew they had a past, you knew there was probably some unhappiness there, but he wasn't going to talk about it." He also made appearances in television series such as "Gunsmoke" and "Alfred Hitchcock Presents." His first starring role in a series was as the title character in "Shane" in 1966. He was the son of actor John Carradine, a character actor who appeared in hundreds of films, plays and television episodes. The site also includes an "Art Bio" in which the actor opens up about his life.